The Players' Goals & Dreams Fund to donate a projected $750,000 in equipment in celebration of the 15th anniversary of their grassroots hockey program. Celebrations include multi-city tour and game-worn jersey auction to help grassroots hockey. TORONTO (November 13, 2014) -‎ This season the National Hockey League Players’ Association (NHLPA) will celebrate 15 years of the NHLPA Goals & Dreams fund (G&D) helping children worldwide play the game of hockey. G&D is conducting a multi-city tour with special events connecting Players and grassroots hockey organizations to mark its 15th anniversary. 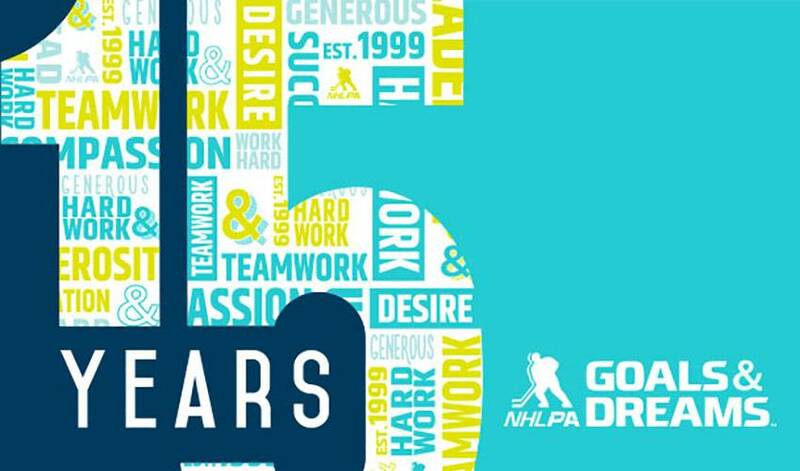 Nearly 15 years to the day that the Players launched the NHLPA Goals & Dreams fund, the NHLPA will commence a multi-city tour with the first event to be held in Minnesota on November 18th. Each of the events on the tour will feature current Players and G&D ambassadors, as well as include children from grassroots hockey programs affiliated with the fund. As part of the tour, G&D will also make an important donation to each program. The activities scheduled for each event on the tour will be fun, exciting, and diverse in nature, and the tour stops will focus on the Players providing children with guidance on various topics such as active and healthy living, goal setting, positive living, leadership and much more. The Players will engage with the children in on-ice and off-ice activities, which will include team-building and physical fitness exercises, and discussions on nutrition and life skills. This unique tour will start in Hastings, MN next Tuesday with children from the Defending The Blue Line and Hastings Minor Hockey organizations. The second event on the tour will take place in Ottawa, Ontario on December 8th with children from the Sledge Hockey of Eastern Ontario (SHEO) and Project North / Ottawa Inuit Children’s Centre. Following that, the tour will stop in Vancouver, BC on December 18th with children from BC Minor Hockey and KidSport BC. In the new year, the tour will stop in Toronto, ON in January 2015 with students from Eastern Commerce Secondary School and the HEROS program, in January 2015, while the final scheduled tour stop will take place in Los Angeles, CA in early 2015 with children from the Hawthorne Force Hockey program, in early 2015. An online auction will also be launched by NHLPA Goals & Dreams to further help the grassroots hockey programs involved in the multi-city tour, and will feature a total of 15 game-worn jerseys, three of the jerseys to coincide with each city / event on the tour: one All-Star jersey and one 2014 Olympic men’s hockey jersey – both of current players, and one jersey of a superstar player who formerly played in the respective city. Proceeds raised during the online auction will be donated back by G&D to the grassroots hockey programs participating in the tour. Additional events and activities will also be held to celebrate G&D’s 15th anniversary.